Measurement Message from Altamira 11,000 B.C. Measurement Message from Altamira 11,000 B.C.- Under the name Cave of Altamira 18 caves are grouped together northern Spain. They represent the apogee of Upper Paleolithic cave art in Europe. This was between 35,000 and 11,000 years ago (Aurignacian, Gravettian, Solutrean, Magdalenian, Azilian). Collectively, the caves were designated as a World Heritage Site by the UNESCO in 2008. Measurement message of the primary cave of Altamira in its overall rectangular outline. A cube has 12 edges. Twelve edges of one inch per side = 12″= 1 foot. Musicians will most likely notice the 2 to 1 ratio of the floor’s proportions. These same proportions were recommended by Pythagoras. 10.500 years later this Greek philosopher stated the same ratio, after the unison, was most harmonious : The perfect interval of not the same tone (unison) and 1st overtone is the octave. It vibrates in a 2:1 ratio. The designers of the cave exhibition most likely knew this. Its measure is the product of basic consecutive numbers. 5 x 6 = 30 (the width in feet). 3 x 4 x 5 = 60 (the length in feet). Very important: The formula for the megalithic yard uses all fives and sixes: (5 x 6) ÷ ( 5 + 6) = 2.727272… One megalithic yard is 2.72 feet. The builders of the Great Hall of Altamira knew this. 2nd factor uses 3,4,5 as 3 x 4 x 5 = 60. Numbers 3, 4 and 5 are the basis of the Pythagorean Theorem: 3² x 4² = 5². Also, look at the musical intervals above. These 3,4, and 5 factors figure into these basic harmonious intervals: 4:3 = perfect fourth. 5:4 = the major third. The diagonal of the 30 x 60 rectangle would be 67 feet. The perimeter around this first half triangle is :30 + 60 + 67 = 157 feet. This figure (157) is one half of the pi figure of 314 made by the triangles made from a diagonal in a rectangle. Conclusion: The wisdom of a lost civilization is preserved in measure at the Cave of Altamira. Perhaps the builders and artists were the survivors of Atlantis? Measurement message and music message are there. Of course, that the advanced artwork is there is a given! Astromusic: The Connection of Music to the Stars. The following is an excerpt from my upcoming book, Music Under the Stars. I need about 6 more months. Pythagoras believed that the whole cosmos was permeated by heavenly harmony. Not surprisingly, he reflected the Egyptian point of view. This philosopher studied in Egypt. Pythagoras taught: Music was the way to escape from the binding hand of the “wheel of life”. That is also a premise of my book Music Under the Zodiac. Only, I specify what to listen to, and which key signature, in order to escape from the binding hand. Music freed the body of “bestial flesh”, brought about by “cosmic karma”. In the time of Pythagoras it was thought that the star called Vega lit the harp of Orpheus in the small constellation known as Lyra. Legend had it that the strings of Vega’s harp were tuned by the Sun. The result was that Orpheus’s music was totally enchanting. Like Pythagoras, Orpheus taught that harmony of spirit was acquired by listening to harmony of sound. As medicine purified the body, music purified the soul. You will also be shown in my book, Music Under the Zodiac, how to utilize this premise. Astromusic- music and astrology were intimately connected in ancient Greece. The influence of the 7 acknowledged planets of the ancients are still with us today. Each one of our seven days of the week were imbued with the essence of one the seven planets and seven gods. Thus we have: (1) Sun day for Sunday (2) Moon day for Monday (3) Tiw’s for Tuesday and the planet, Mars. (4) Wooden’s day for Mercury for Wednesday (5) Thor’s day for Jupiter and Thursday (6) Frigg’s day for Friday and (7) Saturn’s day for Saturday. The Ionic lyre, perfected in the early 7th century B.C. by Terpandros of Lesbos (the “father of Greek music”), became another seven member of the “seven” league with its seven strings. Looking at what things have in common is almost alien to our current way of thinking. Today’s science trains us to look at differences. Truth is a blend of similarities and differences. More on this in the future. Astromusic: Capturing the power of the Stars with music. Pythagoras was possibly the first to write about the basic, perfect intervals. The first four intervals by overtones are considered perfect. The higher note of the interval holds the higher number of vibrations per second. (1) The unison (C to the same C) which vibrated on a 1 to 1 basis (2) the octave (an example being C to C’). The notes vibrated in a 2 to 1 ratio; (3) the fifth (C to G) which vibrated on a 3 to 2 ratio. (4) The fourth (C to F). It vibrated on a 4 to 3 ratio. These ratios were and still are considered the most harmonious and therefore are called perfect intervals. 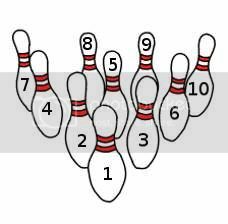 They pyramid the first four numbers like bowling pins set up in a bowling alley. These “perfect” proportions were also applied to buildings to produce harmonious and perfect effects. Architecture thus becomes “frozen music”. Was Bowling Invented by the Ancient Greeks? These, pins, arranged in pyramided fashion, demonstrate the ultimate model of a paradox: In complexity there is simplicity. In simplicity there is complexity. Was Bowling Invented by the Ancient Greeks? When dots are substituted for these for these 10 bowling pins, their arrangement in ancient Greece was called the “tetraktys”. 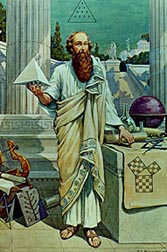 Note the dots in the triangle over his head of Pythagoras in the picture. He lived from 569 BC up to somewhere between 500 and 475 BC and described the 10 dots of the tetraktys as follows: “It is both a mathematical and physical symbol that embraces within itself the principles of the natural world, the harmony of the cosmos, the ancient ascent to the divine, and the mysteries of the divine realm” (Quote from The Illustrated Signs and Symbols Sourcebook by Adelle Nozedar). Here’s how it ties into music: The two to one relationship of the 1st three pins represents the vibration ratio of the musical octave. Pins 2 and 3 to 4, 5, and 6 expresses the ratio of the musical fifth. Finally, rows three to four, being to 4,5,6 to the 7,8,9, and 10 pins, are the vibration ratio of the perfect fourth. Here is the crux: The musical intervals of the octave, fifth and fourth are the most perfect and fundamental overtones of nature. If you work at building your civilization on the bowling pin idea, you have an harmonious and well functioning society. The thought behind this being that same ratios that please our ears through sound, also please our eyes by sight. The perfect harmony in your surroundings helps to make the person who lives in such a society happier, and more content. We need to follow the path of peace.